Split Time Graphs now on Android! – Zombies, Run! Split Time Graphs now on Android! 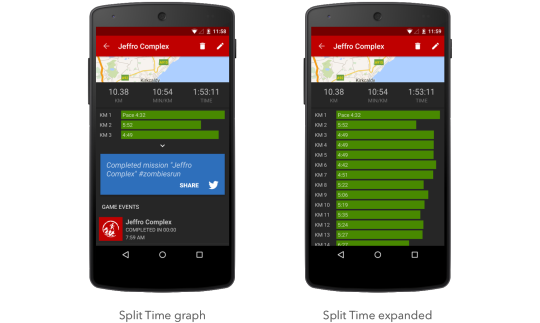 In our latest 4.1.5 update for Android, we’ve added split time graphs! You can now view your performance in detail for every run. Simple, but powerful. We’ve also released 4.1.5 for iOS today, introducing calorie tracking, along with fixes for Airdrop Mode and mapping issues.